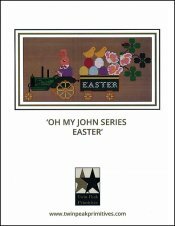 Oh My John Series: Easter [C5076] - $13.00 : Yarn Tree, Your wholesale source for cross stitch supplies. Cross stitch pattern by Twin Peak Primitives. Here comes Peter Cottontail driving down the bunny trail! A wagon full of Easter eggs & baby chicks is being pulled by Mr. Cottontail. "Easter," is stitched on the side of the wagon. Don't go hippity hoppin' down the trail before you get this design stitched! Stitch count is 158W x 80H. Stitched on #7548 Zweigart Aida 14ct. Dirty.